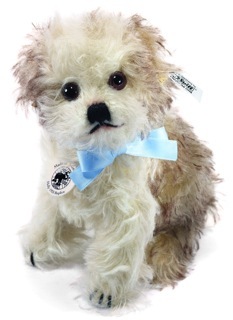 For Fall 2012, Steiff produced Molly dog as a 1925 replica. Sitting 5-1/2 inches tall (14 cm), Molly is made from a fine, curly, long pile mohair in vintage white with brown tipping. Her nose, mouth, and claws are elaborately hand embroidered. She features big, brown handmade glass eyes. Relive Steiff´s glorious "dog years" with the Molly 1925 replica. Can you believe that Teddy bears were once not king at Steiff? It´s true - for a period in the 1920´s, the dog replaced the Teddy bear in popularity at the company. One of the most notable dogs was Molly - with more than a half million pieces produced between 1925 and 1932. Molly remained in the line through the beginning of World War II and was even popular into the 1950´s when production resumed after the war. Through the years, Molly has been manufactured in all manner of colours and sizes - as well as a handbag, pin cushion, hand puppet, and, musical piece, and pendant.